FEEBLEBMX.COM Feeble BMX Vancouver - So ironic it's not. So un-ironic it is. A deep, double apex corner leading into the full pipe. Look at all that pool coping. Well the photos say it all. There are three sections to the park. 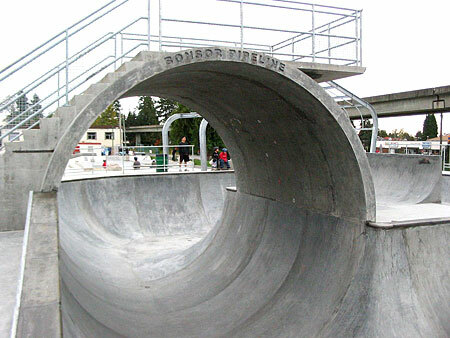 A 'Pro' section which is a fairly big bowl and full pipe. 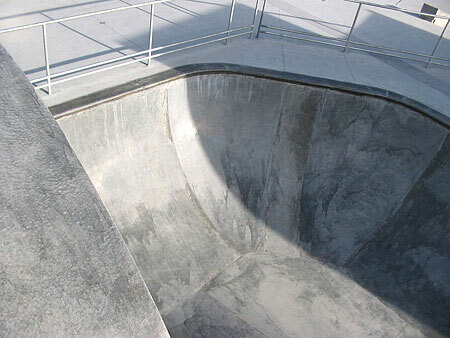 The bowl drops down from 5' deep to around 8' or 9' deep in the sides and around the pipe. There is also a small vert wall thing. To the side of the big bowl is the Dogleg bowl. This is a rounded flow bowl that actually works really well on a skateboard. It doesn't flow very well on a bike though unfortunately. 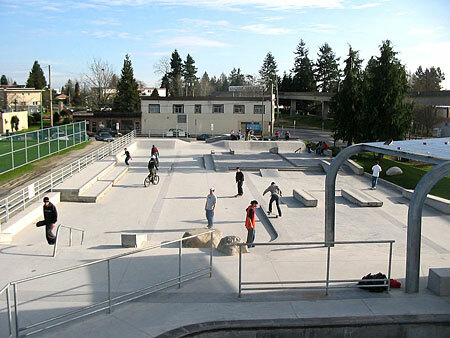 On the other side of the big bowl is the street plaza area. It's actually a pretty shoddy street course that is mostly curbs and open space. Not much to do here and no flow at all. The city should have hired New Line to design the street area at least because it was botched pretty badly. There is one nice gap to manual that's fun for a minute. There is also a small gap to rock. 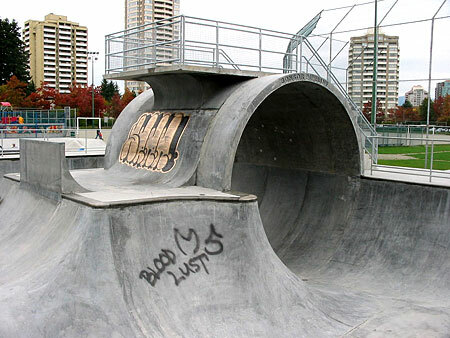 Basically the fullpipe is the only unique feature of the park. The rest of the design is pretty stock but having it all in sections is a nice touch. 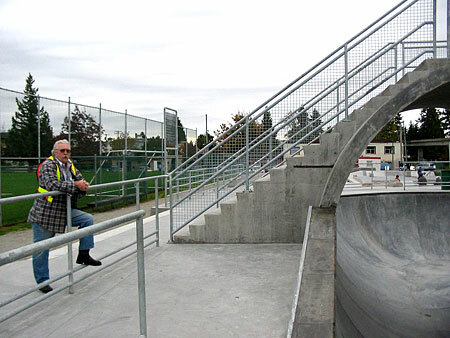 Bonsor is somewhat of a focal point for a little bit of animosity towards BMXers. 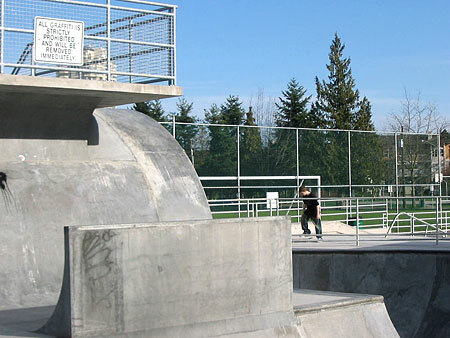 The bowl is surrounded with pool coping that the park builder added at the last minute without telling anyone. Thanks to Spectrum designs for that. 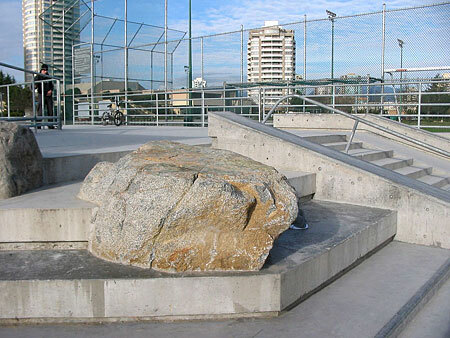 Spectrum changed the bowl over to pool coping and used that as a tool to try to keep bikes out. It seems that there is a war going on between old skaters who don't even skate anymore and BMXers. Funny but nobody told the people who still skate. 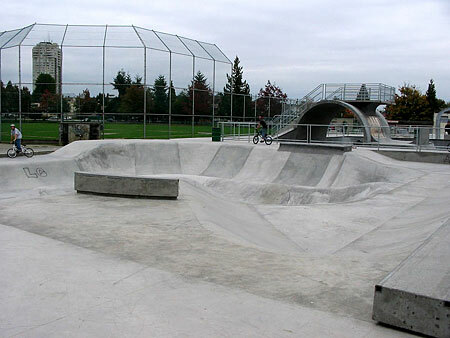 I went and rode this bowl with no problems at all. Nobody said a word to me. Of course I didn't grind or stall any of the pool coping so that probably helped. 99% of good skaters are super cool and don't have a problem with BMX if you aren't cutting anyone off. It's just that 1% of young teens and old schoolers who have something to prove. Just ignore them and ride. Take the Skytrain, Expo Line, and look out the window to your left. 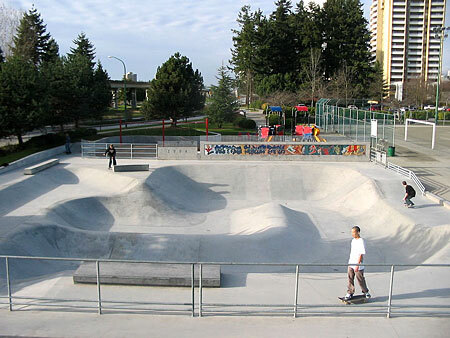 In between Metrotown and Royal Oak station you will see the park. Small vert wall in the shallow and the pipe in the deep. Another view of the pipe. If you see a guy who looks like this then it's time to get kicked out. It looks like there was a small channel here for a bit. The sign says "All Graffiti is strictly prohibited and will be removed immediatly". Another view of the mellow Dogleg bowl. 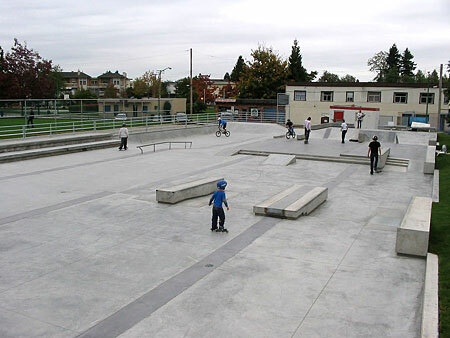 This is where most of the skaters hang out. Everything is pretty tiny and there isn't much flow. This gap to rock is probably the best thing in the park. 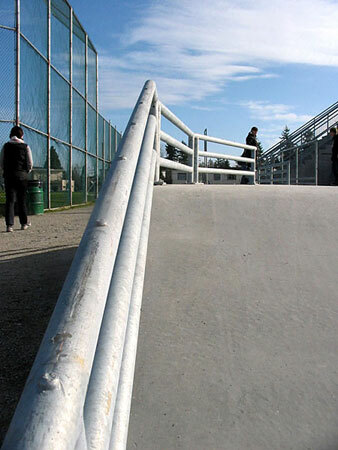 Burnaby even skatestoppers rails in parks now. What the hell is that all about?